It is composed of a pair of pulleys (the groove width is changed freely in the axial direction) and the steel belt (the steel plates are placed continuously and the belt is guided with the multilayer steel rings on both sides). The groove width changes according to wrapping radius of steel belt and pulley from low status to overdrive status continuously with non-step. It is controlled with the oil pressures of primary pulley and secondary pulley. It is composed of multiple steel plates and two steel rings stacked to a several number. The feature of this steel belt transmits power with compression of the steel plate in contrast with transmission of power in pulling with a rubber belt. Friction force is required with the pulley slope to transmit power from the steel plate. The force is generated with the following mechanism: Oil pressure applies to the secondary pulley to nip the plate. ⇒The plate is pushed and extended outward. ⇒The steel ring shows withstands. ⇒Pulling force is generated on the steel ring. ⇒The plate of the primary pulley is nipped between the pulley. ⇒Friction force is generated between the steel belt and the pulley. Therefore, responsibilities are divided by the steel plate that transmits the power with compression and the steel ring that maintains necessary friction force. In this way, the tension of the steel ring is distributed on the entire surface and stress variation is limited, resulting in good durability. The primary pulley (input shaft side) and the secondary pulley (output shaft side) have the shaft with slope (fixed cone surface), movable sheave (movable cone surface that can move in the axial direction) and oil pressure chamber at the back of the movable sheave. The movable sheave slides on the shaft to change the groove width of the pulley. 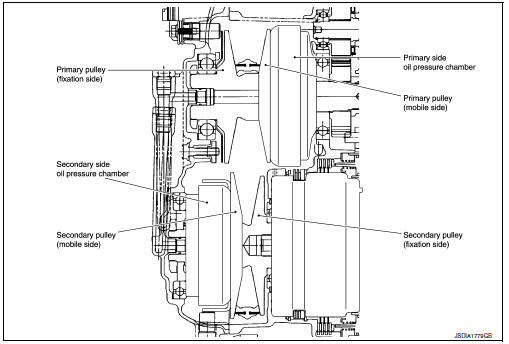 Input signals of engine load (accelerator pedal opening), engine revolution and gear ratio (vehicle speed) change the operation pressures of the primary pulley and the secondary pulley, and controls the pulley groove width. 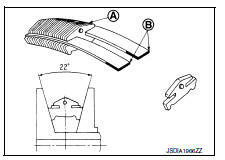 Along with change of the pulley groove width, the belt contact radius is changed. This allows continuous and stepless gear shifting from low to overdrive. вЂњThe contact radius ratio of each pulley in contact with the belt x auxiliary gearbox gear ratioвЂќ is the gear ratio. 1st, 2nd and reverse gears are changed with the planetary gear mechanism. 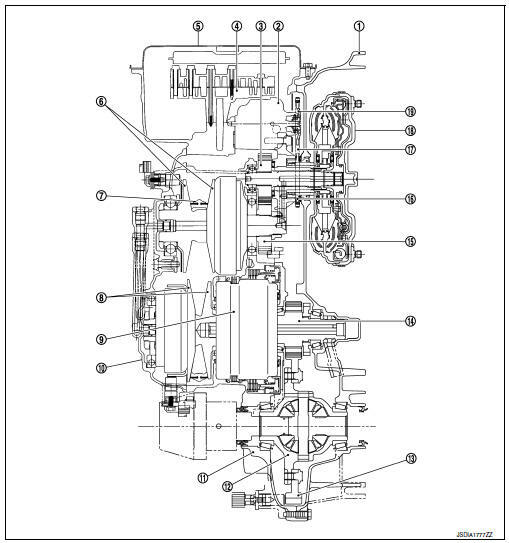 Oil pressure required for operation of the transaxle transmission mechanism is generated by oil pump, oil pressure control valve, solenoid valve, etc. Torque converter It is composed of the cover converter, turbine assembly, stator, pump impeller assembly, etc. It increases the engine torque and transmits the power to the transaxle. Oil pump Through the oil pump drive chain, it uses the vane oil pump driven by the engine. It generates necessary oil pressure to circulate fluid and to operate the clutch and brake. Counter gear set The power from the torque converter is transmitted to the primary pulley through the counter drive gear and the counter driven gear. Belt & pulley (Continuously variable transmission) It is composed of the primary pulley, secondary pulley, steel belt, etc. and the mechanism performs shifting, changes the gear ratio and transmits the power with oil pressure from the control valve. Auxiliary gearbox (stepped transmission) It is composed of the planetary gear, multi-disc clutch, multi-disc brake, etc. 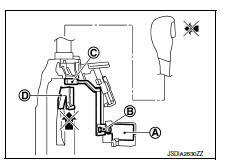 and the mechanism performs shifting (1-2 gear shifting and reverse) with oil pressure from the control valve. Reduction gear set Conveys power from the transmission mechanism to the reduction gear and the final gear. Control valve Controls oil pressure from the oil pump to the pressure suitable for the line pressure control system, shift control system, lock-up control system and lubrication system. Pressure regulator valve Adjusts the discharge pressure from the oil pump to the optimum pressure (line pressure) corresponding to the driving condition. 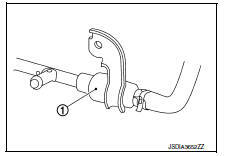 Torque converter regulator valve Adjusts the feed pressure to the torque converter to the optimum pressure corresponding to the driving condition. Pilot valve Adjusts line pressure and produces a constant pressure (pilot pressure) necessary for activating each solenoid valve. 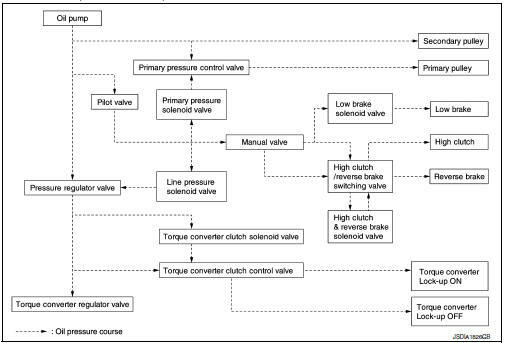 Manual valve Distributes the clutch and brake operation pressures (pilot pressure) corresponding to each shift position. 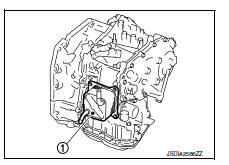 High clutch/reverse brake switching valve Switches the circuit for the high clutch and the reverse brake. Torque converter clutch control valve It is operated with the torque converter clutch solenoid valve and it adjusts the tightening pressure and non-tightening pressure of the torque converter clutch piston of the torque converter. Primary pressure control valve It is operated with the primary pressure solenoid valve and adjusts the feed pressure to the primary pulley. Primary pressure solenoid valve TM-79, "CVT CONTROL SYSTEM : Primary Pressure Solenoid Valve"
Low brake solenoid valve TM-79, "CVT CONTROL SYSTEM : Low Brake Solenoid Valve"
High clutch & reverse brake solenoid valve TM-80, "CVT CONTROL SYSTEM : High Clutch & Reverse Brake Solenoid Valve"
Torque converter clutch solenoid valve TM-80, "CVT CONTROL SYSTEM : Torque Converter Clutch Solenoid Valve"
Line pressure solenoid valve TM-81, "CVT CONTROL SYSTEM : Line Pressure Solenoid Valve"
The CVT oil warmer is installed on the front part of transaxle assembly. When engine is started while engine and CVT are cold, engine coolant temperature rises more quickly than CVT fluid temperature. CVT oil warmer is provided with two circuits for CVT and engine coolant respectively so that warmed engine coolant warms CVT quickly. This helps shorten CVT warming up time, improving fuel economy. A cooling effect is obtained when CVT fluid temperature is high. The heater thermostat open and close with set temperature. The shift lock is the mechanism provided to prevent quick start of a vehicle by incorrect operation of a drive when the selector lever is in вЂњPвЂќ position. Selector lever can be shifted from the вЂњPвЂќ position to another position when the following conditions are satisfied.
. The selector lever cannot be shifted from the вЂњPвЂќ position for this reason. shifted to other positions for this reason. above. The selector operation from вЂњPвЂќ position can be performed. 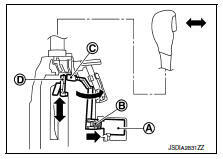 Use the shift lock release button only when the selector lever cannot be operated even if the brake pedal is depressed with the ignition switch ON. The key is not set to LOCK when the selector lever is not selected to P position. This prevents the key from being removed from the key cylinder. when the selector lever is in any position other than вЂњPвЂќ position. rotates together with the key cannot be rotated for this reason. The key cannot be removed from the key cylinder because it cannot be turned to LOCK . because it can be turned to LOCK .